The purpose of this eGuide is to provide our customers with information regarding Staph Infection, a plan of action BEFORE a pandemic strikes, information on how to care for an infected person, and also to provide the customer with the best quality products to protect you and your family from Staph Infection and a multitude of other harmful disease causing microorganisms. 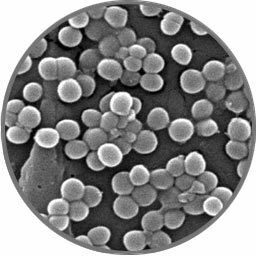 Staph (staphylococcus aureus) is a type of bacteria. It’s very common to find on areas of the skin where cuts, abrasions, bug bites, or other breaks in the skin occur. The bacteria may also be colonized, meaning in a dormant state, unless the skin is irritated. If the skin is irritated, staph can multiply quickly. Inhalant allergies, food allergies, or irritating chemicals can cause severe itching, which can lead to a staph infection. Staphylococcus Aureus and other bacteria are present on 90% of staph infections. The bacteria seem to attach more readily to skin that is inflamed & can make the inflammation worse because they secrete substances called super antigens. These allergy-inducing substances activate the immune cells in the skin, causing them to release substances that further increase inflammation. Controlling the number of these bacteria on the skin can help control the infection. Anti-Microbials are commonly used to treat infestation. Some staph bacteria are resistant to antibiotics. MRSA is a type of staph that is resistant to antibiotics called beta-lactams. Beta-lactam antibiotics include methicillin and other more common antibiotics such as oxacillin, penicillin and amoxicillin. 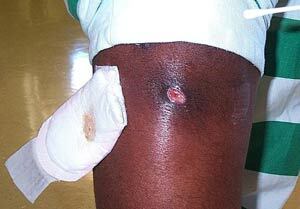 While 25% to 30% of the population is colonized with staph, approximately 1% is colonized with MRSA. Who Can Contract Staph Infections? People who work in medical environments, prisons, and in schools or who already have a weakend immune system are at a higher risk of contracting a staph infection than others. However, anyone can contract a staph infection through an open wound. The infection is documented to spread primarily through direct skin-on-skin contact and one’s environment has also been found to play a role in the trasmission of Staph Infection. What Does Staph Infection Look Like? Staph bacteria, including MRSA, causes skin infections that may resemble the appearance of a pimple or boil and can be red, swollen, painful, and/or have pus in and around the affected area. If left untreated Staph Infections can create much more serious problems for its host. Staph infection may lead to such illnesses as pneumonia, bloodstream infections, surgical wound infections and in some cases may even turn into a flesh eating bacteria. In those extreme cases the bacteria multiply at a much faster rate than the antibiotics can keep up with thus eating away at one’s flesh. Because Staphylococcus Aureus and other bacteria are present on 90% of Staph infections, this bacteria seems to bond more readily to skin that is inflamed & can make the inflammation worse because they secrete substances called super antigens. These allergy-inducing substances activate the immune cells in the skin, causing them to release substances that further increase inflammation. Controlling the number of these bacteria on the skin can help control the infection. Anti-Microbials are most commonly used to treat infection. That’s why PuraCleenRx™ offers the perfect solution! Cover your wound. Keep wounds that are draining or have pus covered with clean, dry bandages. Pus from infected wounds can contain staph and MRSA, so keeping the infection covered will help prevent the spread to others since the spread of Staph is proven to be related to direct skin-on-skin contact. Clean your hands. You, your family and others in close contact should wash their hands frequently with soap and warm water or use an alcohol-based hand sanitizer, especially after changing the bandage or touching the infected wound. Do not share personal items. Avoid sharing personal items such as towels, washcloths, razors, clothing or uniforms that may have had contact with the infected wound or bandage. Wash sheets, towels and clothes that become soiled with water and laundry detergent. Drying clothes in a hot dryer, rather than air-drying, also helps eliminate bacteria in clothes.